In recent years, companies have started to repurpose the massive amounts of used-once-then-trashed plastic in new and exciting ways. For example, REPREVE, a sustainable fiber created from 100 percent food-quality and BPA-free plastic, is being used in a variety of products from clothing to couches. Lovesac is a green furniture company using the recycled fabric to cover sofa cushions. While the eco-friendly material is a huge component of the design, it’s just a sample of an entire furniture line aimed at sustainability. In a world of disposables, the company’s goals push back with a focus on design for a lifetime. It’s a concept that not only includes durability in its couches, called sactionals, but also caters to the ever-changing needs of seating demands. The sactional is a versatile, modular design that you can easily customize to fit your space. Simply choose from the many ottoman, seat and side arrangements for the look and seating capacity that suits your needs. Then, arrange and rearrange any way you like. 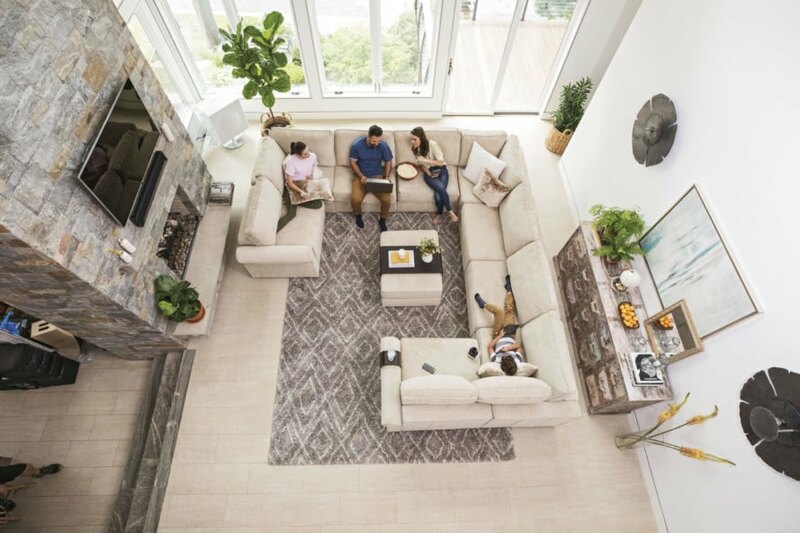 With a lifetime guarantee on the sactional, the company estimates that this grow-with-your-demands product will replace the purchase of four couches during its lifetime. With the introduction of the the Sactional, Lovesac has continued its theme of lifetime products with removable, washable and replaceable covers. Dirty covers can be washed. Torn covers can be replaced. When the now-trendy slate twill color becomes a throwback, you can update it without the cost or waste of replacing the entire couch. Even better, the upholstery fabric for the couches is made from hundreds of tossed single-use water bottles, which are given new life through REPREVE fabric. Depending on the components chosen, between 600-1200 water bottles are used in the production of each Sactional. For 2018 alone, Lovesac expects to repurpose around 11 million water bottles through its efforts. True to the overarching goal of creating an environmentally-friendly couch, the Sactional is neatly packaged and shipped in bleach and dye-free recyclable kraft cardboard. Unlike the traditional sofa set that requires two heavy lifters for transport, when it’s time to relocate to a different level of the house or new home altogether, the entire sectional can be broken down into manageable pieces for the move. The 'Sactional' by Lovesac is a modular couch made with a unique cover fabric. The cover is made using REPREVE fabric, a material made from recycled water bottles. The couch is designed to change and adapt with the owners. The sofa is also simple to deliver, put together or take apart for moving. Lovesac's commitment to sustainable design is only enhanced by using the innovative REPREVE fabric.